Whether the occasion is formal or casual, you are set to use this square counter height table set for a dinner party or a simple breakfast with family. 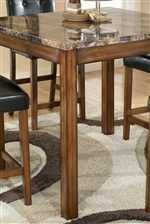 The faux marble top complements the warm brown of the clean line contemporary legs. The four gathering height brown PVC upholstered bar stools feature tufted backs and accent top stitching for comfortable seating at the table. The Theo 5-Piece Square Counter Height Table Set with Bar Stools by Signature Design by Ashley at Value City Furniture in the New Jersey, NJ, Staten Island, Hoboken area. Product availability may vary. Contact us for the most current availability on this product. Table Info Square Counter Height Table with Faux Marble Top. Table Dimensions: 42 1/16" x 42 1/16" x 36 1/8"
Side Chair Info 24 Inch Bar Stools. Bar Stool Dimensions: 18 1/4" x 21 1/4" x 40". Finish Aprons and legs made from select veneer and solids with a warm brown finish. 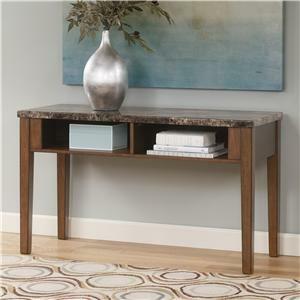 Finish & Paint Options Tabletops with a faux marble look and warm brown finish on select veneers and solids. Handles & Hardware Dark bronze colored hardware. Case Detail Slightly tapered legs and pedestal bases on casters in a warm brown finish. 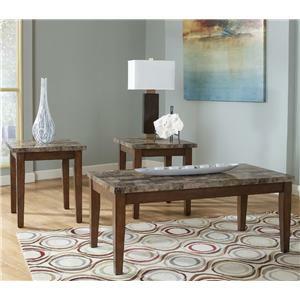 Description: Top Table tops feature faux marble tops with polyurethane coated finish over print marble. Case Construction Constructed of select veneers and solids in a warm brown finish. Tables include faux marble tops with polyurethane finish. Warranty Products shall be free from defects in material and workmanship for a period of one year to the original purchaser, under normal household use and service, following the date of purchase to the original purchaser. Faux marble tops are the highlight of the contemporary and sophisticated Theo collection. 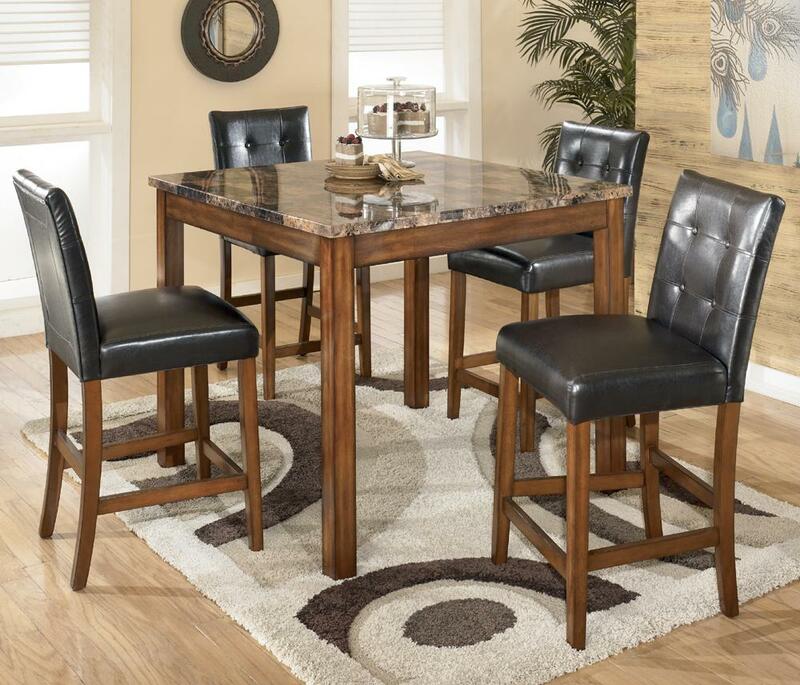 A five-piece counter height set with upholstered bar stools makes for an ideal gathering place when placed in kitchens or dining rooms for casual and comfortable dining. The same great look of warm brown finished tapered legs with faux marble tops continues to home furniture and a set of occasional tables that includes a sofa table/TV console, cocktail table and two end tables for a seamless transition from dining to living rooms. Add exceptional form and high functionality to nearly every room of your home with the understated styling of the Theo collection. The Theo collection is a great option if you are looking for Transitional furniture in the New Jersey, NJ, Staten Island, Hoboken area. Browse other items in the Theo collection from Value City Furniture in the New Jersey, NJ, Staten Island, Hoboken area.